In Matrimony (aka The Matrimony, or Xin zhong you gui), a spooky, dark-wooded mansion houses a movie cinematographer (Leon Lai) forlorn over his deceased fiancé, while the woman he chose as a "replacement" -- a rustic girl (Rene Liu) lacking the same appeal, considered little more than a house guest -- fruitlessly tries to fill her shoes. He keeps a room closed off, presumably with his old love's things cradled within, and it's a space he deems his wife unable to enter under any circumstance, though we're pretty aware of how well that idea will hold up. Once she inevitably stumbles into that room, filled with mirrors and furniture draped with dirty sheets for her to spookily pull away, she meets eye-to-eye with a specter (Bing Bing Fan) of the woman dominating her husband's affection, whom we determine appears from ... an unplugged radio. The big question: what does she, still adorned in the blood red coat from the day of her accident, want? This Chinese import from romance director Hua-Tao Teng steeps itself in genre tropes while telling a somber tale of love's desperation, mixing Hitchcock's Rebecca and Mizoguchi's Ugetsu for a restrained, conventional poise that quietly flirts with traditional horror. 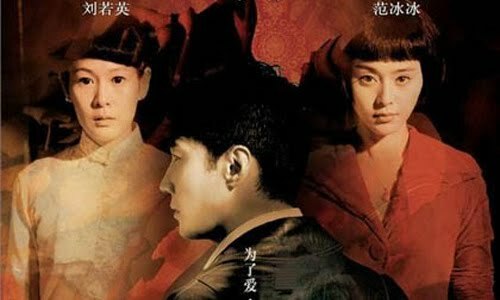 This isn't a story to elicit dread around every corner, much like comparable films that have emerged from Japan (Ju-on) and Korea (Tale of Two Sisters); the pictorial '30s-era tale concerns itself with the mentality of both the filmmaker, Junchu, and his wife, Sansan, one unable to let go and the other unable to wedge herself in, with the ghost of Manli as the missing ingredient to their brew. It's only once the spirit proposes a seemingly warm-hearted offer to Sansan -- a plea to allow her to "possess" her living body in a time of crisis -- that it bridges the gap to chilling paranormal motives. Focused on a stifled atmosphere, Matrimony navigates the eerie space of Junchu's mansion alongside the memories of both Manli and Sansan that pass through his mind, which In the Mood For Love's co-cinematographer Mark Lee Ping Bin brings to ominous life. He captures the '30s China tone with a chilly, gothic eye for detail, poring over items in the mansion -- a bathtub emitting steam, reels on a projector, the intricacy of a scratchy radio, and even the hair atop Sansan's head -- and giving them a distressing visual poise that constantly reminds of the spirit that churns in the closed-off room. Once Hua-Tao Teng starts incorporating haunting angles (peering through an upstairs banister) that suggest her scopophilic presence more directly, the mood really takes off in the picture's hazy stir. Through delicate framing and a steady, lavish perspective, the lo-fi visual appeal on display really stands out. This melancholy ambience wraps you up while it tells a spooky paranormal yarn, a good thing considering the story that Matrimony dresses up lacks much expressive inventiveness, relying on moody photography and raw anticipation to propel its cut-and-dry theatrics. Sympathy is felt for the unwanted Sansan, sure, a lowly seamstress constantly reminded that she's essentially being done a favor by marrying Junchu, which adds magnitude to her desperate conversations with the specter -- alongside her memories of the first time she met her husband, a quaintly-beautiful scene on a snowy New Year's Eve. But when Hua-Tao Teng approaches something that would take the eerie expressive fabric to another level -- such as when Manli offers to possess Sansan's body to show her how to make love -- it recoils back into a tempo more centered on intimacy and uneager to push further, skimping on opportunities to deepen the paranormal intrigue. Instead, Hua-Tao Teng weaves together the two women's affections into a steady swell of distress, the macabre take on a love triangle guiding its pace into terse territory once Manli's motives, unsurprising but captivating, become clear. Matrimony lets that slowly-burning flame blaze a bit brighter and more unruly nearing the conclusion, flexing the muscle behind blunt-force jolts and a spooky long-haired fiend once the paces picks up. Even so, it never loses focus on Sansan's internal anxiety while doing so, latching onto her self-effacing nature to the rush of (often easy) twists that populate its climax -- including an unnecessary cork at the end that, fittingly, pulls a punch that's best left telegraphed. None of that holds Matrimony back from the luxuriant, affective supernatural chiller that it succeeds at being, though; it just makes it less satisfying as a vision of subtle horror.